The LBC library has close to 900 bridge books and continues to grow. Initially books were purchased from either Bridge Fokes or from a Bridge Club in the USA. But since our club opened, over half of our books have been donated by local players. 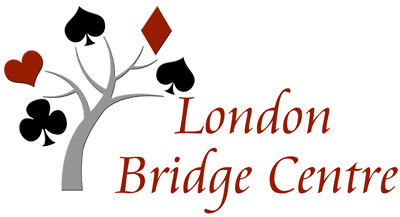 We recently received a very major donation from Les Bushfield, a former bridge player and Director. Les donated 101 books, 44 of which are new titles to the Library. In early 2017, Audrey Craig also made a large donation to the Library. Lynn Coveney, Jackie Potters, Audrey Devries, Lyn Kligman and Doug Elliot donated several books in 2017. In addition, Audrey Grant donated a supply of her instruction materials when she visited the club in the fall. Many thanks to all donors for their generosity and please keep the donations coming! 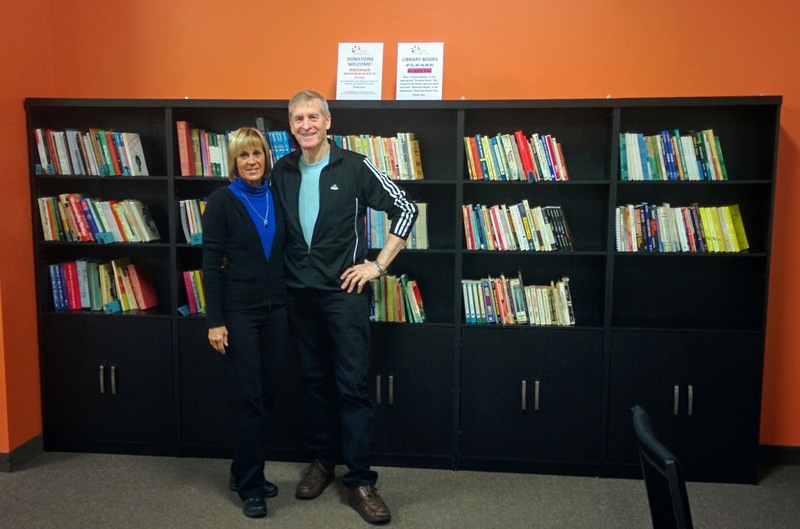 And a special thanks to our librarians, Roger and Judy Jolliffe, who have organized and catalogued our library. Roger and Judy will be maintaining the library to ensure books are returned and kept in order. Please help them and other members by following our sign out and sign in procedures. As at January 2019, your Library has increased to almost 970 books with over 500 titles, more than double the amount from when the club was first formed in late 2015. Unfortunately, 92 books are currently missing. Books are organized in the Library in alphabetical order starting with the first listed author’s last name and then the book title. Note also, that all Library books are listed on the website in the same order. If you are looking for a particular topic, and can’t seem to find it, let us know and we can do a search of the inventory file to see what we can locate for you. If you’d like to take a book home, please complete the “Sign-Out Sheet” on the nearby table. It’s crucial that this information is complete and legible. This data is added to our tracking system, and, if not accurate, causes a significant amount of extra work and complications for your Librarians. When you return a book, please complete the “Return Date” on the “Sign-Out Sheet”. It is very easy to misfile the books, so please DO NOT FILE books but simply place them in the “Returned Books” bucket on the table. We will do the filing. We’d very much appreciate any book being returned within 30 days. Overdue book notices will be sent to individuals at regular intervals. We appreciate that on occasion a member may wish to keep a book longer. If so, we request that you insert the current date in the “Returned Date” column of your original sign-out location, then, simply sign out the book a second time in the first available spot. Again, thanks to all who continue to donate books and have been the reason for the amazing growth in the Library. We continue to welcome donations, and request that any donated book be placed in the “Donated Books” bucket on the table. Missing books are a continuing problem for LBC. Please follow the procedures so we can keep track of this valuable club asset. Many of these books have been missing for an extended period so we would very much appreciate you taking a moment to ensure that you do not inadvertently have any “unsigned-out” bridge books in your possession. Library books will have a stamp or sticker with the club logo on the inside cover or front page. If you do find a book, it would be greatly appreciated if you could return it to the “Returned Books” bucket on the table near the Library. 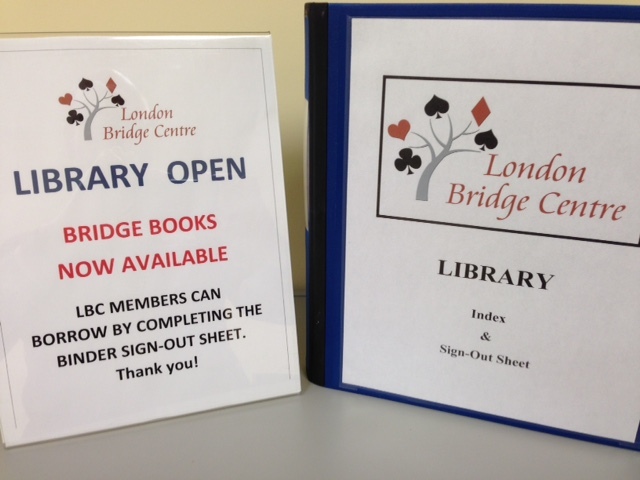 The Library is available to all, including non-LBC members. However, if you are not a member, we ask that you provide us with your contact information, either an email address or phone number. When signing out your book, simply take a second line on the sign-out sheet to provide this information. Thanks very much for your co-operation. We would like our library to be easily accessible to our members and we need your help to maintain our library. We have a library Index, a Sign Out procedure, a Return procedure and a Donation procedure. Your assistance in maintaining our library would be greatly appreciated. This this list will be kept up-to-date. Return the book within 30 days after sign-out. Return the book to Returned Books Shelf in the library bookcase located closest to the rear door. We are pleased to announce a major addition to the LBC library. Al and Sue Edwards have kindly donated their collection of the Audrey Grant Periodical "Better Bridge". This periodical is published every two months, and the donated collection includes most issues from 2004 to the present. These are excellent magazines, enjoyable at any level, but particularly beneficial for developing players. Leading bridge experts consistently produce highly readable articles on bidding, play of the hand and defense. Bridge puzzles also complement the articles by testing the concepts presented. The Bridge Bulletin magazines are located on a coffee table beside the main library, and have their own sign-out sheets. We are extremely pleased to see that the library is being well utilized. And thanks to most of you for being diligent in fully completing the sign-out and return information. We note however, that occasionally a phone number or other detail is not recorded. It would be quite helpful and greatly appreciated if everyone could take a little extra time to complete the information fully. And thanks very much to Audrey Devries for her recent donation of 6 great bridge books to our library. Many LBC members have been asking for a general book exchange area to be set up at the club. Intitally, the club focused on establishing a bridge libray. Now we would like to initiate a general book exchange. A book case has now been placed in the northwest corner of the bridge hall for members to exchange books. Please feel free to bring books or to borrow books from the book exchange. Please, do not place donated books in the bridge library! The bridge library is only for bridge related books.